HB477 • Action stops bill from going into effect immediately so problems can be worked out. 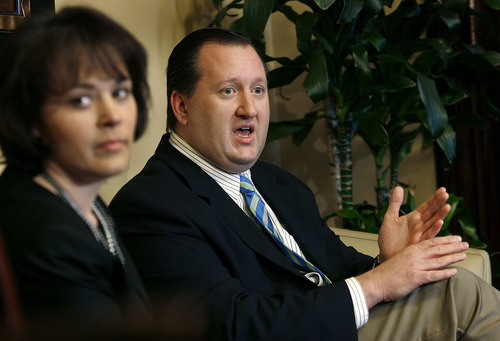 File Photo | The Salt Lake Tribune Senate President Michael Waddoups, R-Taylorsville. SCOTT SOMMERDORF | The Salt Lake Tribune Speaker of the House Becky Lockhart, R-Provo, and Rep. John Dougall, R-Highland, talk to reporters about HB477, which amendments the state's open-records law. The bill was recalled Monday after its earlier swift passage through the House and Senate. SCOTT SOMMERDORF | The Salt Lake Tribune Rep. John Dougall, R-Highland, speaks during a press availability in the office of the Speaker of the House on Monday. Dougall mainly fielded questions about HB477, the bill he sponsored to change the state open-records law. To address concerns of Gov. Gary Herbert, lawmakers Monday recalled the controversial bill that they had passed quickly last week to shield more records from public disclosure and charge more for those that would still be available. The Senate voted 23-6 to stop HB477 from going into effect immediately and delay its implementation until July 1. The House quickly followed suit, approving the effective date change by a vote of 42-29. Herbert said he was "pleased" by the Legislature's action Monday "and I'm encouraged they are committed to amending the bill in order to provide for a more thorough and deliberative process." In his prepared statement, the governor added, "Good public policy demands good public participation. I reiterate my commitment to the principles of open and transparent government." Senate President Michael Waddoups said the move is to allow lawmakers to work with the governor and the news media on ways to fix problems with the bill and amend them during a summer special session of the Legislature. "I think this is a good process that will allow the press and the public … to discuss this issue for the next 90 days," Waddoups said. Earlier, the Senate president said Herbert "doesn't like the process that we went through. He feels it was rushed. We all have to grant him that point. … It was rushed. There's a reason for that," Waddoups said. He said the move Monday was needed to avoid a veto. Sen. Chris Buttars, R-West Jordan, said the Senate "had a very spirited caucus lunch on the issue, to say the least" on the proposed changes to the Government Records Access and Management Act (GRAMA). Buttars, the only Republican to vote against the bill when it came before the Senate on Friday, made the motion to push back its effective date. Meanwhile, House Speaker Becky Lockhart, R-Provo, said, "We're responding to our constituents who are saying, 'Give us some time to have some more input on this,' so that's what we're doing," and said she did not apologize for the House's process. Lockhart said the Legislature would have a working group to deal with issues relating to GRAMA through June, then the governor would call a special session in June to make the necessary changes. Waddoups said, "The bill is passed now. Now, we want to back off a little bit and tweak it." He also said such tweaking may be needed to avoid a veto by Herbert. "I think we'll convince him there's another way besides a veto." Herbert's concerns came to light after the bill whipped through the Legislature in just 72 hours. Its text was unveiled last Tuesday night, it passed a House committee Wednesday, passed the House on Thursday and passed the Senate on Friday. No one testified in favor of the bill  while the news media and government watchdog groups said it would gut what has been a good open-records law. Still, the bill passed by two-thirds majorities in both houses  showing the Legislature may have power to override a veto if it comes. "Yes, but we're a Legislature of good government. We want to work it out so that it works for everybody. 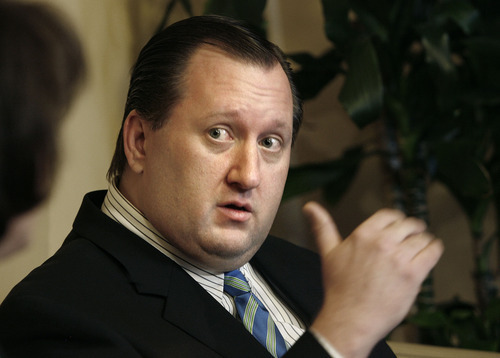 We're not into sticking a finger in the governor's eye" by overriding a veto, Waddoups said. He said previously that legislators wanted to pass the bill during a nonelection year when opposition from the media would matter less. Sen. Lyle Hillyard, R-Logan, the Senate sponsor of the bill, also said lawmakers moved it quickly to counter "misinformation" about it that he expected the media to spread and make it difficult to pass. Waddoups has also said the Legislature initially wrote the bill so that it would be effective immediately upon the signature of government, in part, to head off what it figured would be an onslaught of GRAMA requests from the news media before the weaker law took effect at the end of the legislative session. Lockhart said on Monday that the Legislature has received 22 GRAMA requests since the bill was passed on Friday. Waddoups said it is important now to "have a time period before it [the bill] goes into effect when we can discuss modifications and clarify the language, specifically which documents are available, and which ones are private." HB477 would prohibit the disclosure of text messages and instant messages, allow government agencies to charge fees that can include administrative and overhead costs and require requesters wanting records protected by the government to show with a preponderance of evidence the records should be released. Senate leaders also posted a blog complaining, "With a few very impressive exceptions, media outlets struggle to cover HB477 objectively. We don't blame them, but it means we won't win the PR [public relations] war." Robert Gehrke and David Montero contributed to this report.